God help him, he was alone in the state that wanted him dead, and there wasn’t a place here that wasn’t out for his blood, whether it was the mosquitoes or the gigantic thorns on those trees or those damned pyramids of rocks that *they’d* built, or the dark spirits that lurked at the edges of the magic that he and Sarae had created together. Their magic had pushed those foul spirits back, but for how long? And what did Sarae have to do with any of this? Nothing. She had nothing to do with that dead deer or those spirits. But he knew that they would kill her, yes, and Marcus too, to get to Remy. 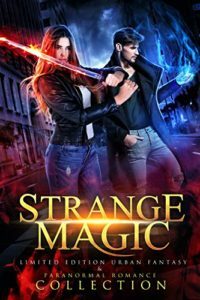 Now available in the Strange Magic boxed set! This series will be exclusive to Radish for six months -- and then will be released on Amazon and other online booksellers beginning in August 2019. In the Midnight Hour is currently available on Radish (and completed) here. There are some steamy scenes, which I had to tone down in the boxed set. Look out for those. Or look for them, if you are so inclined. Black Night is Falling is the second book in the series, available on Radish. This series is in progress. I wanted to have it done in January but then I got hit with a crapload of overtime at work and my brain went on an extended vacation. Must be nice!! Things are slowing down here at work at last and I hope to start posting Black Night to Radish this month. Keep your fingers crossed! And thanks so much for your patience.